Both local and foreign investors operating businesses in Laos have been encountering problems stemming from the chronic labour shortage. “We are experiencing an annual shortfall of labourers in excess of 31,000 people,” said a senior advisor to the Lao National Chamber of Commerce and Industry. 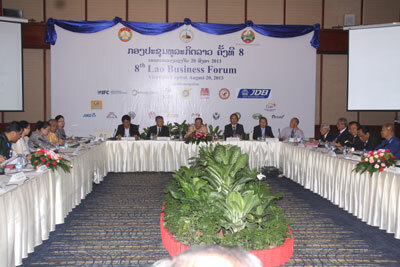 Mr Onesy Boudsivongsakd made the observation at the 8th Lao Business Forum held in Vientiane on Tuesday, aiming to highlight the labour problems to the government and find appropriate solutions. “This figure does not include the workers required by the two sugar companies operating in Savannakhet province or those needed to harvest latex from rubber plantations around the country, which amounts to several thousand more,” Mr Onesy said. Mr Onesy said the garment industry employs 31,000 workers but requires an additional 9,930 people each year. At present, however, only 650 labourers are available. The industrial processing sector has a labour pool of 20,000 people but requires an additional 300 employees, while the tourism sector currently employs 28,100 people and needs an additional 2,400 each year. The steel rod production group employs 1,150 people but needs an additional 600 people per annum, and the furniture production association employs 6,000 people but needs an additional 5,000. The construction sector employs 100,000 people but needs an extra 5,500 workers, while the KP industry group has a labour pool of 1,500 but needs 2,900 more. In addition, Nikon needs about 1,500 people and Essiloz is seeking another 3,000 employees. Mr Onesy said that in the midst of this labour shortage, som e 100,000 people are crossing the border to seek work in other countries, and there are no controls in place to stop this exodus. Many areas in the central and southern provinces have no young people to work in the rice fields since most prefer to work in other countries, leaving the job of subsistence farming to the older folk. The labour shortage and high turnover of employees is a ma jor challenge both for existing investors and those just setting up business in Laos. Even though the Ministry of Labour and Social Welfare has created 15 employment agencies, there is still a serious labour shortfal l.
There are also problems in granting permits to investors and business groups to collaborate with local authorities to recruit labourers in local areas independently, since they come under the legal authority of the employment agencies. In Savannakhet province, a foreign employment agency uses buses to pick up workers and take them across the border to their place of work. In Luang Prabang province, foreign employment agencies, in cooperation with Lao recruitment agencies, have arranged for locals to work across the border. More than 700 people in Luang Prabang have been interviewed for employment in other countries. “I think it’s time for us to retain our young workers so that we can build up and develop the country,” Mr Onesy said. ?????? ?, ?????????????????????? ??? ????????? ??????????????? ????????? ???????????????????? ?, ??????? ???????? ?, ??????? ?, ?????????????????? ?, ?????????????? ?, ??????????? ??? ????? ?????????????????? : ??? ???. ??? ???????????? ????????????????????????????????????????????????? ????????????????????????? ??????????????????????????????? ????? 157.000 ??? ??? ?????????????????????? ??????????????? 30.000 ???. ????????????????????????????????????? ?????? ??????????? ???????????????????????????????????????????????????????????????? ??????????????????????. ????????????????? ???????????? ??????? ?????? ??????????? ?????????????????? ??? ???????????????? ???????????????????? ?????? 8 ????? ?????????????. ??????????????????? : ????????????????? ??? ???????????????????????????? ?????????????????????????? ??????????????????????? ?????????????? ??? ????????????????????????????? ?????????????????????? ??? ???????????-?????? ??????????????????? ???? 15 ??????? ?????????????????????????????????????????? ??????????????? ?, ??????????????????????????????????????????????????? ?????????????????? ??? ??????????? ?????????????????????????????????????? ??????????????????????????????????????????????????????. ????????????? ????????????????????????????? ??????????????????????????????? ????????????????????? ????????????????? ??? ?????????????????????????????????????????????????? ????????????????????????? ??????????????????????????????????????? ???????. ????????????????????? ?, ?????????????????????? ??? ???????????????? ???????????????????????? ?????????????????? 2015 ??? : ????????????????????????? ???????????????????? ???. ??? ??????????????? ??? ?????????????????????????? ?????????? ????????????????????????????????????? ?, ????????????????????????????????????????????????????????????? ?????????? ????????????? (AEC) ?????????????????????????? ?????????????????????????????? ?????????????????????????????????????? ??? ??? ?????????????????????????? ?, ????????? ??????????? 2013 ????????????????????????????? ???????????? ?????????????????????????? ??? ?????????????????????? ??????????? ??????????????????????????????? ??????????????????????????????? ????????????????????????????????????????????????????????????????????????????? ?, ??????? ???????????????????????? ?????????????? ?????????????????????????????????????????????? ?????????????????????????????????????????????????????? ??? ?????????????? ??????????? ??????????????????????????? ????????????????????????????????????? ??? ???? ?, ?????????????????? ????????? ???????????????? ???????????????????????? ??? ????????????? ?????????????????????????????????????????????? ?????????????? ?.